We can’t think of many things worse than living in the Arizona desert without air conditioning. So, when we get the call that someone in Glendale needs AC repair, servicing or installation, we make it our top priority to get there quickly and promptly; we strive to always ensure that local each family’s climate control needs are met in a timely fashion. With an extreme focus on stellar customer care, our team of friendly, knowledgeable technicians come prepared to provide expert service with a smile. We don’t mark any project or service call complete until our valued customer is – more than just satisfied – but totally happy with the service they received and the end result of an optimally-functioning HVAC system. Though our winters are relatively mild, those nights can get more than a bit chilly, which is why we offer residents a host of HVAC and furnace service options too. From complete installation to emergency furnace repair, our team of experts deliver the HVAC services that get your system working at its best, any time of the year. 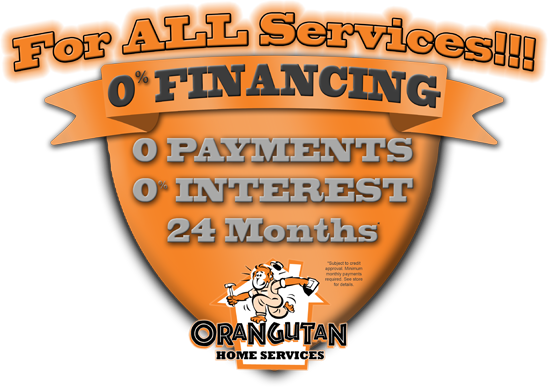 For any home services need, call Glendale’s Top-Rated Local® AC/HVAC experts at Orangutan Home Services. Named by industry experts as the #1 air conditioning repair and heating contractors in the US for three straight years, we are the choice of you friends and family. Find out why by calling 602-892-9948 today!